Gwalior, one of the former princely states of India is today an important city in Madhya Pradesh, with over 2 million people calling it home. The city has a sizeable number of vehicles on its roads, with two-wheelers accounting for around 70% of them. In terms of vehicle registrations in the state, Gwalior saw over 46,000 vehicles registered during 2013-14, which was an annual increase of 38.73% over the previous year. This number has increased each year, which has contributed to an increase in incidents of road accidents, with two-wheelers being involved in most of them. A good insurance policy is a must for riders in the city, for it not only helps offset losses during an accident but also provides peace of mind. The government has made it mandatory for all two-wheelers to have insurance, with the authorities powered to take action in case of any violation. The names mentioned above are not ranked in any specific order and just highlight the popular options in the city. Insurers provide the services of cashless garages in Gwalior, aiming to improve their customer rating. These garages can be utilised by customers in case of any accident. Insurance companies have gone out of their way to tie up with local garages to attract new clients. An individual looking to service his/her bike at a cashless garage can do so without any hassle. Locating cashless garages in Gwalior is easy, with a number of ways to do so. The official website of the insurance company typically has information about cashless garages. One can navigate through the website to locate the nearest network garage. With the advent of mobile apps one can search for a network garage using the app. Customers can call customer care executives of the insurance company and ask them to provide relevant information pertaining to network garages. An individual can approach an agent of the insurance company and ask him/her to provide details of network garages in a particular location. The policy brochure might contain a list of network garages in the city. Simple – One needn’t spend time running around trying to find a garage to fix the damage. In case of network garages the insurer handles all aspects, with the customer expected to intimate the insurance company and provide certain details. There is no need to negotiate with the garage over the cost of repairs, argue over the time required to get the damage fixed, etc. Faster – The turnaround time when a bike is given for repairs at a network garage is much faster when compared to a regular garage. Network garages often have a sense of professionalism, ensuring that the damage is fixed and the bike delivered on time. Quality – Network garages are known to use quality spare parts. This ensures that there is no further damage to the bike on account of fake parts. Additionally, these garages hire expert mechanics and technicians, enabling them to fix complicated issues. This can be extremely useful in case of imported/rare bikes. Financial savings – The insurance company settles the bill directly with the insurer. This means that the owner of the bike/policyholder need not pay any amount from his/her own pocket. Replacement vehicle – Certain insurance companies offer the services of a replacement vehicle while the damaged vehicle is in the network garage. This varies from insurer to insurer. 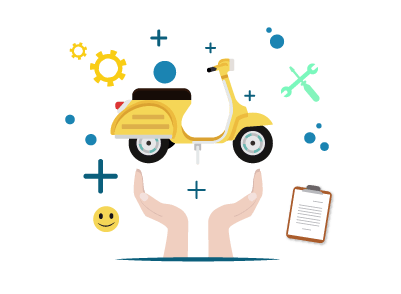 Add-on services – Network garages are known for additional services like roadside assistance, towing, bike pickup and delivery, etc. A good two-wheeler insurance policy can be extremely useful during an accident. Choosing the right insurance policy can be hard, especially given the number of options available. Individuals looking to purchase a bike insurance can get a better deal if they keep these simple points in mind. Cost of policy – The policy should be affordable. Insurance companies offer a range of discounts on the premium. One should compare the options before purchasing the policy. The premium is determined by taking factors like the city of registration, cost of vehicle, age of bike, etc. into consideration. Cover type – There are two cover options which are popular in India – Liability-only and Comprehensive. A comprehensive cover is a smarter option for Indian roads, given the number of accidents. Policy term – Most insurance companies offer policies with a term ranging between 1 year and 3 years. Opting for a longer term can be more economical, with a reduction in the premium amount. Claims process – Select an insurance company which has a simple and efficient claim settlement process. Network garages – Make sure that the insurance company has a decent number of network garages, especially in the city of residence. Inclusions/exclusions – Check the inclusions and exclusions of each policy before purchasing it. With Gwalior just a few hundred kms from the national capital of India, a number of two-wheelers registered in different states can be found in the city. Individuals who are looking to purchase a used two-wheeler should ensure that the insurance policy is transferred to their name, for failing to do this gives the insurer sufficient grounds to reject a claim. Transferring ownership of the insurance policy is simple and can be done by following these basic steps. Inform the insurer about the sale of bike. Provide details of sale to the insurer. These include documents like the sale deed, NOC, registration certificate, etc. The buyer should provide his/her personal details to the insurer. The buyer is expected to pay any transfer fee (if applicable). Once the insurance company has verified the documents it will transfer the policy to the buyer.